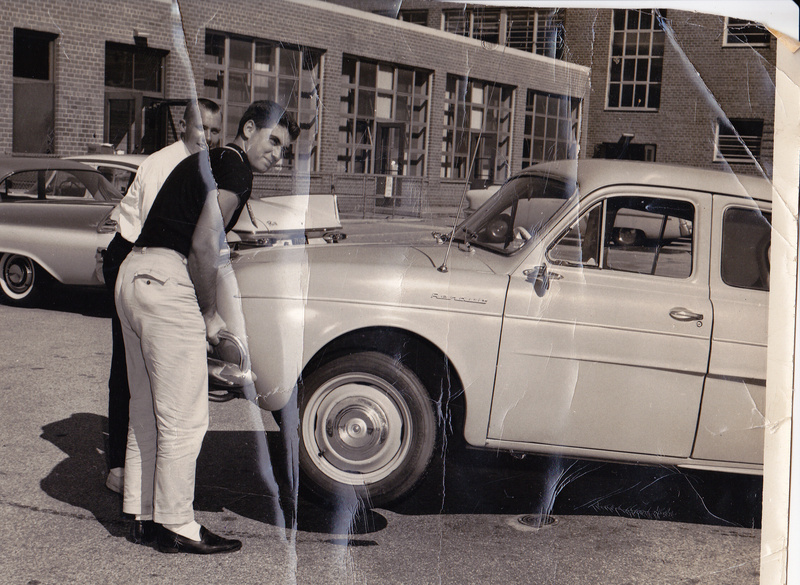 When I bought my first car in 1960, neither my father nor I knew anything about them. That might explain why I chose not to buy a bathtub Porsche (356) after the accelerator cable broke during a test drive. To this day, I don’t trust Porsches, but I do wonder where it might have taken me. Instead, I bought an early 3-speed, four-door Renault Dauphin (late 1950’s). Ignorance is bliss, and it was certainly the case here after I spent the $600 I earned during sweaty summers at Long Island’s Jones Beach. I was very proud I bought it with my own money and made us a two-car family In those days, the usual choice at my high school was between a muscle car and a sports car. With the Dauphin, I wound up somewhere repugnantly in between. It was flesh colored, and no matter how many coats of Simoniz I put on it, I was always able to put thumbprints in the paint. It certainly was something of a joke at school. Lifting the front end was common; that’s me in my parent-imposed crew cut. I remember it not starting one day. I discovered someone had put bubble gum in the distributor. I immediately went to the J. C. Whitney catalog and bought a locking handle for the rear hatch to prevent more tomfoolery. I further immersed myself in the Whitney catalog. Soon, the Dauphin’s front fenders were plastered with large moon eyes, and there were small bare feet tracking their way down the rear bonnet. I had a gearshift extension and chrome knobs on the radio. About the only mechanical thing I did was to disconnect the muffler at the manifold and enjoy driving around, while the valves burned, as if I really had a lot of engine under my foot. I used to make up stories that I’d run into a passel of VW bugs, raced them all, and was always victorious. Considering the Dauphin had a grand total of twenty-seven horsepower and a zero to sixty time of thirty-seven seconds, this was obviously a very grand delusion. I’m not quite sure of the sequence of unusual events that required my long-suffering father to tow me home too many times to remember. I had my first accident in that car, but it was for a good cause. I was ogling a particularly tasty young lady sashaying by, and I rear ended a pickup truck. The other driver wiped my paint off her bumper, and I stared at the crease across the front of the hood. Then, there was the time when it was my turn to drive four members of my high school basketball team to the beach to hustle cash at the beach clubs’ courts. The Dauphin carried the eight- or nine-hundred pounds of young galouts without incident although we stayed in the slow lane and stopping was problematical. We parked at Jones Beach and wandered down the shoreline seeking an unguarded club. Getting in was usually an adventure. Somehow, we had to hide our basketball shoes and gear in various bags, go into the ocean, and try to come in looking like we had exited and gone swimming. This trip was on a particularly hot day. I watched the temperature gauge climb higher and higher with some trepidation. I was relieved to watch it drop down from its most extreme setting. Oddly, when I shut the car off, it continued to run. I lifted the rear bonnet to discover that the block was red-hot. I guess it was somewhat fortunate that the Renault had an easily repaired wet-sleeve engine, since I had probably blown every seal and mixed all its fluids. It was fixed at some shop and back on the road looking for more ill-fated adventures. One interesting idiosyncrasy that the Dauphin developed was that when I speed shifted from first to second, the stick moved but the transmission didn’t. A kind mechanic showed me how to take the inspection plate off the transmission, stick a screwdriver in, and flip first-gear back to where it was supposed to be. Of course, this involved removing somewhere between 12 and 16 bolts. At least once, I forgot to drain the transmission first and wound up with a face full of fluid. All of this was done without the benefit of a jack and on my back on the grass next to my parents’ driveway. All too often it did this when I was on a date. I, then, had to drive the utterly unimpressed lass home in first gear. If I didn’t know what embarrassment was at that point, I did very quickly. After fifty years, it still remains one of my great faux pas. Nov. 4, 2016, 1:19 p.m. I had a Dauphine as my first car as well, it may have been a 1961, but it looked exactly the same, not pretty, fast or all that reliable... The thing drank oil and left a cloud like a 2 cycle Saab running down the road. One day I was running late and did not feed the beast enough oil and wait for it.... BAAMMM!! number 3 rod straight through the block. The amazing thing was, it was high enough on the block, I was able to add oil, start it back up and continued driving, the only reason I stopped driving it was because it was really slow with only 3 cylinders... Oh, and the burning and now leaking oil problem. Like you said, you can't forget those memories!